Are you a fabric-a-holic like I am? I have tons and tons of fabric … in every color, shape and size. When we moved from California, I had all my boxes of fabric very neatly labeled and numbered. You see, I didn’t want any of them to get lost or misplaced. If I remember correctly, between fabric and patterns and notions, I probably had close to 40 boxes of various sizes. Keep in mind that I’m a quilter, and before we moved I owned an online quilt store, hence my “reason” for having so much. My husband jokingly filled a box with his stuff and labelled it 1/1. Silly man! I think the quantity of his garage boxes by far surpassed the quantity of my craft boxes. In the last couple of years I’ve become particularly fond of making quilts with solids … preferably the lighter neutrals … the whites and creams. But I quickly have come to realize that I’ve wasted a lot of the leftovers from projects because they’ve all gotten stacked together and it just takes too much time to figure out which is which. So I’ve come up with a quick and easy way to organize neutral solid fabric scraps. I personally love Moda Bella Solids. The texture and feel is soft, the weave is tight, and they go with everything! And even more importantly, they’re the same color on the front and the back of the fabric. This is really important! Not all solids are like this. See the top two whites? … otherwise known as 9900-97 and 9900-98? 9900-97 is Bleached White PFD and 9900-98 is White Bleached. I don’t know what the technical difference is, but there definitely is a difference in the color. One is “brighter” than the other, and as you can tell I lean towards using the 9900-98 more than I do the 9900-97. You’ll also notice that 9900-60 and 9900-11 are very close in color too. One would think that “Snow” would be whiter than a cream, but in the Bella world, it isn’t. 9900-12 is Natural. It’s a great neutral when you’re working with black and want more of the rustic and vintage look. When the bolts are all lined up, it’s easy to tell which color is which. But when they’ve been cut up in strips and squares and there are leftovers, sometimes it’s a little bit harder. 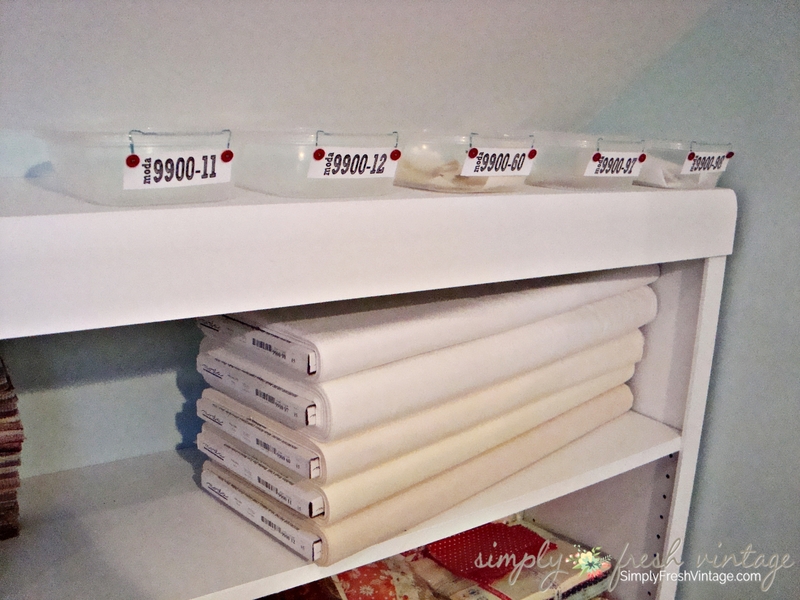 So I gathered up a few supplies and came up with a way to keep those fabric scraps organized. 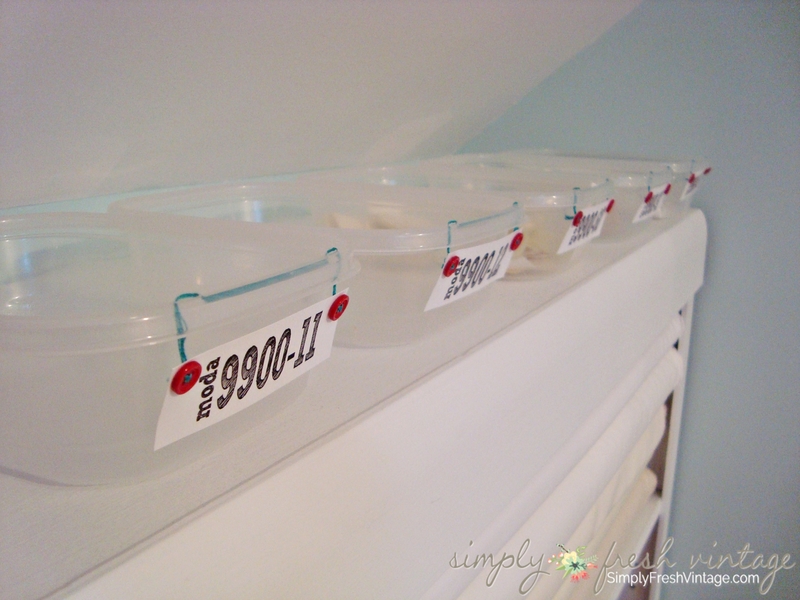 By using disposable plastic containers with cute labels (of course! ), now whenever I pull a bolt to work on a project, I grab it’s corresponding scrap container at the same time. I can try and use up whatever scraps I already have before I cut into the bolt, and whatever is left over after I’m done cutting will go back into the scrap container. 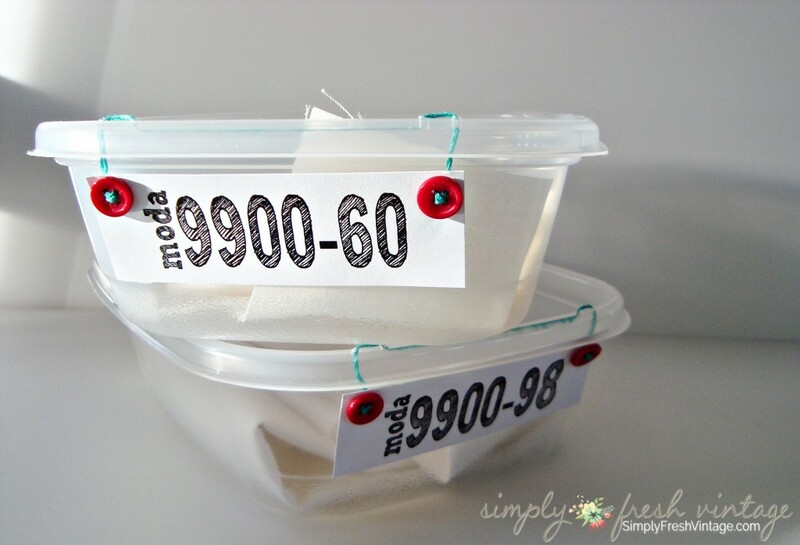 Tomorrow I’ll share a step-by-step tutorial for making the cute tags and attaching them to the containers. They’re super easy and very inexpensive! Are you a fabric hoarder like I am? Do you love to use neutral solids in your projects? I’ve teamed up with 10 fabulous bloggers to share some awesome tips for an organized space. Click on the “Get Organized” picture to see all of great organization tips we have for you! Wow, there are a lot of similar “white” fabrics! Great way of organizing to not get them confused. 🙂 Thanks for sharing Lani!